How do you know if you are in the presence of a true geisha? Here are a few bonafide pointers. 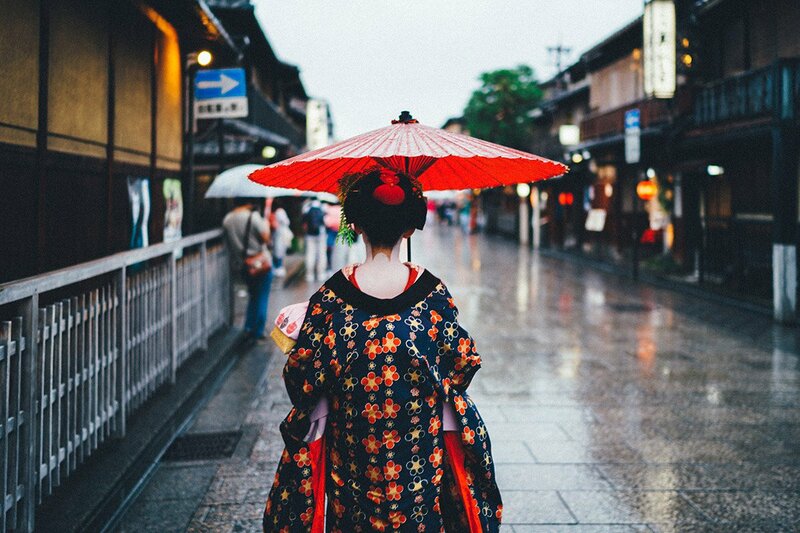 KYOTO, Japan – If it were easy to spot an authentic geisha, or geiko as they're called locally, they wouldn't be so alluring. I learned this on my first trip to Kyoto ten years ago, after mistaking tourists in guise for genuine geiko. Though their stark wigs and flashy kimonos tend to draw every lens in sight, their furtive behavior and dwindling numbers make them a vision more fleeting than cherry blossoms. But with a little bit of gumption and some guidance, travelers can still encounter the real thing. Geiko culture dates back to the early 17th century, when maidens served tea and traditional Japanese sweets at teahouses surrounding shrines and temples. Over time, servers versed in the art of tea ceremony expanded their repertoire to include other forms of entertainment like music, dance, and song. Today, a geiko's feature act takes form at an elaborate banquet. In old-world teahouses, an evening of traditional cuisine, artful games, and sake can be pricey, sometimes costing hundreds of dollars a head, and often booked by businessmen. These charms are in short supply: While tens of thousands existed centuries ago, only a few hundred geiko practice their arts in Kyoto today. The first step to spotting a geiko — or more likely, a maiko, a geiko's apprentice — is to tell if she's a proper geiko or a tourist in costume. The easiest cue is location. Only five hanamachi (geisha districts) exist in Kyoto: Gion Kobu, Miyagawa-chō, Ponto-chō, Kamishichiken, and Gion Higashi. Geiko generally don't wander from their district. Then comes appearance, a geiko's ultimate distinction. Their exacting look can take hours to perfect, and most costume shops take shortcuts. A tourist in costume can get away with relaxed hair, but a geiko will always do sculptural, lacquered updos and wigs. The most distinct feature, the painted face and neck — a laborious layering of wax, paste, and white powder — is often more opaque on tourists, and hastily applied. If your budget is tight but you have time to spend, the scrappiest way to spot a geiko is simply to wait. Arrive in Gion Kobu, Kyoto's largest geisha district, before 6 p.m. Around this time, geisha make their way to teahouses to perform and entertain. You won't be alone: Clusters of camera-clutching tourists will also be looking for geisha en route. Should you spot a geiko, ask permission before invoking your flash — it's impolite to photograph geiko without paying or asking to do so, and, as a result of ambitious photographers, they've lately taken to cabs to avoid the cheap shot. Gion Koubu may be the largest, but the Kamishichiken is Kyoto's oldest geiko district. At the , geiko and maiko take orders for light lagers, sake, and all sorts of Japanese fare in the beer garden (open from July through early September). It's one of the larger formats of the geiko experience and less private than booking an exclusive (and pricey) banquet, but as long as there's room at the table, anyone can get through the door. If you don't mind an understudy, visit the at Kyoto Tower. 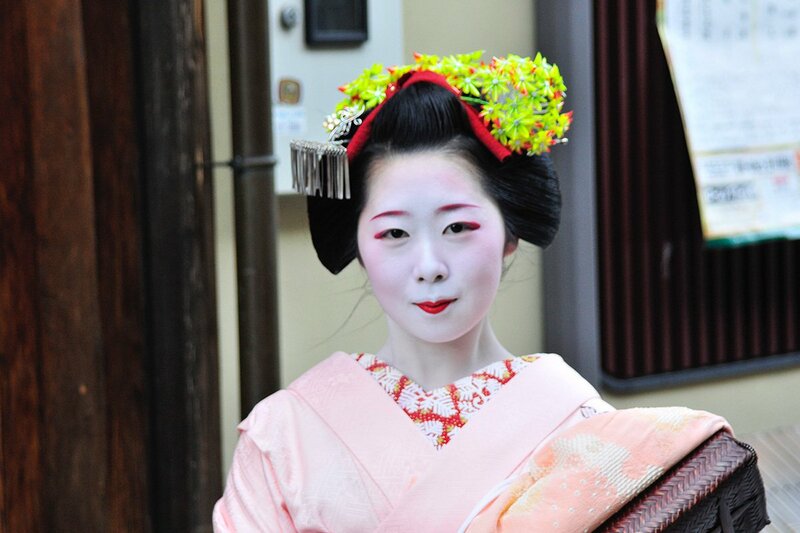 Every Monday, Wednesday, and Friday, the venue hosts late-afternoon performances with maiko, who, at fifteen- to twenty-years-old, are still in training. While the experience is not as elegant as the full service, it's still a rare opportunity to ask maiko questions, from how long it takes to get dressed to what maiko like to do on their infrequent days off. After a few performances, guests can even snap a selfie. While generations of geiko have been off-limits for visitors (particularly foreigners) without a referral from an existing client, today's travelers need only the right concierge. Book well in advance for a room at a traditional Japanese inn like or , and you'll have the opportunity to arrange dinners with the geisha. The paint is still wet at the new where, in the service-forward fashion you can expect from the company, the property unlocks some of the city's more exclusive experiences. For starters, guests can book hosted evenings with geiko at a nearby teahouse, one of the hotel’s signature excursions. But the easiest of experiences lies a mere stone's throw away at the 800-year-old pond garden on site where the hotel hosts performances by maiko every Saturday and Sunday, meaning that guests need not travel far from their rooms to check this one off their bucket list. Keith is a travel writer in Brooklyn. You can follow him @keithflanny on and . He travels for the thrill of seeing — and eating — it for himself.